As already noted, we cannot prevent mass wasting in the long term as it is a natural and ongoing process; however, in many situations there are actions that we can take to reduce or mitigate its damaging effects on people and infrastructure. Where we can neither delay nor mitigate mass wasting, we should consider moving out of the way. It is comforting to think that we can prevent some effects of mass wasting by mechanical means, such as the rock bolts in the road cut at Porteau Cove (Figure 15.10), or the drill holes used to drain water out of a slope, as was done at the Downie Slide (Figure 15.9), or the building of physical barriers, such as retaining walls. What we have to remember is that the works of humans are limited compared to the works of nature. The rock bolts in the road cut at Porteau Cove will slowly start to corrode after a few years, and within a few decades, many of them will begin to lose their strength. Unless they are replaced, they will no longer support that slope. Likewise, drainage holes at the Downie Slide will eventually become plugged with sediment and chemical precipitates, and unless they are periodically unplugged, their effectiveness will decrease. Eventually, unless new holes are drilled, the drainage will be so compromised that the slide will start to move again. This is why careful slope monitoring by geological and geotechnical engineers is important at these sites. The point here is that our efforts to “prevent” mass wasting are only as good as our resolve to maintain those preventive measures. Delaying mass wasting is a worthy endeavour, of course, because during the time that the measures are still effective they can save lives and reduce damage to property and infrastructure. The other side of the coin is that we must be careful to avoid activities that could make mass wasting more likely. One of the most common anthropogenic causes of mass wasting is road construction, and this applies both to remote gravel roads built for forestry and mining and large urban and regional highways. Road construction is a potential problem for two reasons. 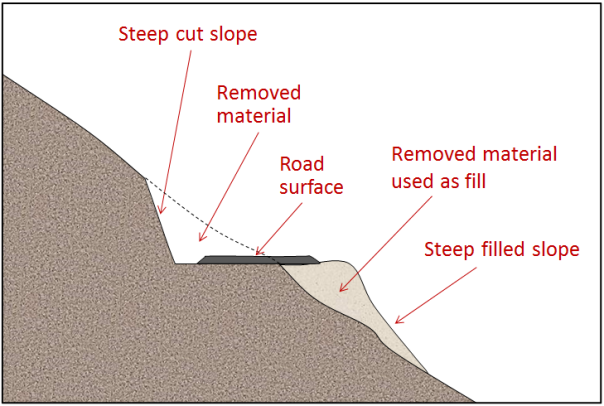 First, creating a flat road surface on a slope inevitably involves creating a cut bank that is steeper than the original slope. This might also involve creating a filled bank that is both steeper and weaker than the original slope (Figure 15.18). Second, roadways typically cut across natural drainage features, and unless great care is taken to reroute the runoff water and prevent it from forming concentrated flows, oversaturating fill of materials can result. A specific example of the contribution of construction-related impeded drainage to slope instability was shown earlier in Figure 15.6. Apart from water issues, engineers building roads and other infrastructure on bedrock slopes have to be acutely aware of the geology, and especially of any weaknesses or discontinuities in the rock related to bedding, fracturing, or foliation. If possible, situations like that at Porteau Cove (Figure 15.10) should be avoided — by building somewhere else — rather than trying to stitch the slope back together with rock bolts. It is widely believed that construction of buildings on the tops of steep slopes can contribute to the instability of the slope. This is probably true, but not because of the weight of the building. As you’ll see by completing Exercise 15.3, a typical house isn’t usually heavier than the fill that was removed from the hole in the ground made to build it. A more likely contributor to instability of the slope around a building is the effect that it and the changes made to the surrounding area have on drainage. Exercise 15.3 How Much Does a House Weigh and Can It Contribute to a Slope Failure? 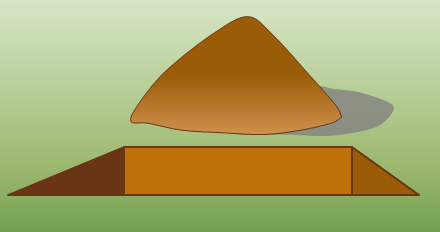 It is commonly believed that building a house (or some other building) at the top of a slope will add a lot of extra weight to the slope, which could contribute to slope failure. But what does a house actually weigh? A typical 150 m2 (approximately 1,600 ft2) wood-frame house with a basement and a concrete foundation weighs about 145 t (metric tonnes). But most houses are built on foundations that are excavated into the ground. This involves digging a hole and taking some material away, so we need to subtract what that excavated material weighs. Assuming our 150 m2 house required an excavation that was 15 m by 11 m by 1 m deep, that’s 165 m3 of “dirt,” which typically has a density of about 1.6 t per m3. Calculate the weight of the soil that was removed and compare that with the weight of the house and its foundation. If you’re thinking that building a bigger building is going to add more weight, consider that bigger buildings need bigger and deeper excavations, and in many cases the excavations will be into solid rock, which is much heavier than surficial materials. You may wish to consider how a building might change the drainage on a slope. There are a number ways. Water can be collected by roofs, go into downspouts, and form concentrated flows that are directed onto or into the slope. Likewise drainage from nearby access roads, lawn irrigation, leaking pools, and septic systems can all alter the surface and groundwater flow in a slope. In some areas, it is necessary to establish warning systems so that we know if conditions have changed at a known slide area, or if a rapid failure, such as a debris flow, is actually on its way downslope. The Downie Slide above the Revelstoke Resevoir is monitored 24/7 with a range of devices, such as inclinometers (slope-change detectors), bore-hole motion sensors, and GPS survey instruments. 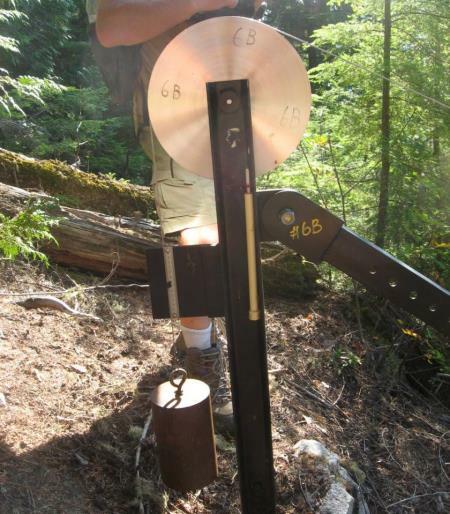 A simple mechanical device for monitoring the nearby Checkerboard Slide (which is also above the Revelstoke Reservoir) is shown in Figure 15.19. Both of these are very slow-moving rock slides, but it’s very important to be able to detect changes in their rates of motion because at both of these locations a rapid failure would result in large bodies of rock plunging into the reservoir and sending a wall of water over the Revelstoke Dam, potentially destroying the nearby town of Revelstoke. Mt. 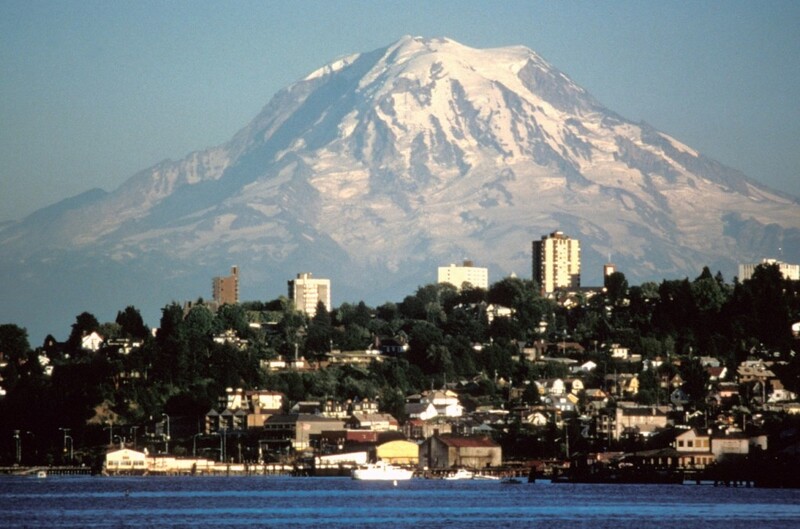 Rainier, a glacier-covered volcano in Washington State, has the potential to produce massive mudflows or debris flows (lahars) with or without a volcanic eruption. Over 100,000 people in the Tacoma, Puyallup, and Sumner areas are in harm’s way because they currently reside on deposits from past lahars (Figure 15.20). In 1998, a network of acoustic monitors was established around Mt. Rainier. The monitors are embedded in the ground adjacent to expected lahar paths. They are intended to provide warnings to emergency officials, and when a lahar is detected, the residents of the area will have anywhere from 40 minutes to three hours to get to safe ground. In situations where we can’t predict, prevent, or delay mass-wasting hazards, some effective measures can be taken to minimize the associated risk. For example, many highways in B.C. and western Alberta have avalanche shelters like that shown in Figure 15.21. In some parts of the world, similar features have been built to protect infrastructure from other types of mass wasting. Debris flows are inevitable, unpreventable, and unpredictable in many parts of B.C., but nowhere more so than along the Sea-to-Sky Highway between Horseshoe Bay and Squamish. The results have been deadly and expensive many times in the past. It would be very expensive to develop a new route in this region, so provincial authorities have taken steps to protect residents and traffic on the highway and the railway. Debris-flow defensive structures have been constructed in several drainage basins, as shown in Figure 15.22. One strategy is to allow the debris to flow quickly through to the ocean along a smooth channel. Another is to capture the debris within a constructed basin that allows the excess water to continue through, but catches the debris materials. Finally, in situations where we can’t do anything to delay, predict, contain, or mitigate slope failures, we simply have to have the sense to stay away. There is a famous example of this in B.C. at a site known as Garibaldi, 25 km south of Whistler. In the early 1980s the village of Garibaldi had a population of about 100, with construction underway on some new homes, and plans for many more. In the months that followed the deadly 1980 eruption of Mt. St. Helens in Washington State, the B.C. 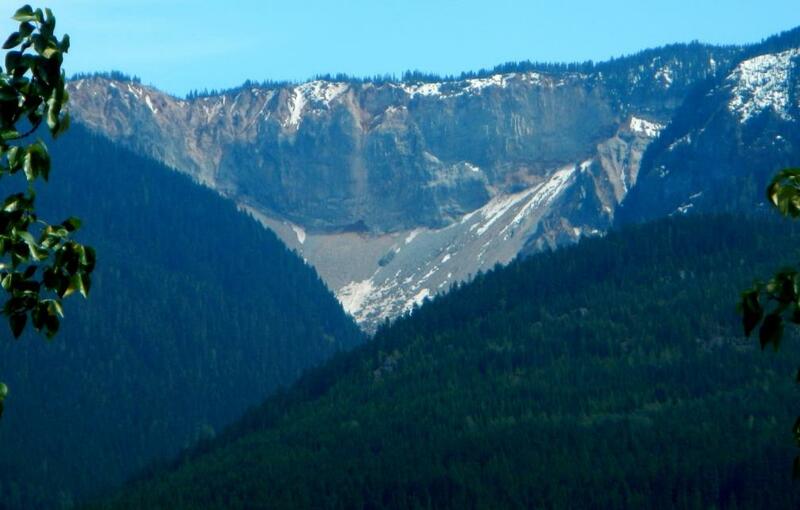 Ministry of Transportation commissioned a geological study that revealed that a steep cliff known as The Barrier (Figure 15.23) had collapsed in 1855, leading to a large rock avalanche, and that it was likely to collapse again unpredictably, putting the village of Garibaldi at extreme risk. In an ensuing court case, it was ruled that the Garibaldi site was not a safe place for people to live. Those who already had homes there were compensated, and everyone else was ordered to leave. 15.3 Preventing, Delaying, Monitoring, and Mitigating Mass Wasting by Steven Earle is licensed under a Creative Commons Attribution 4.0 International License, except where otherwise noted.